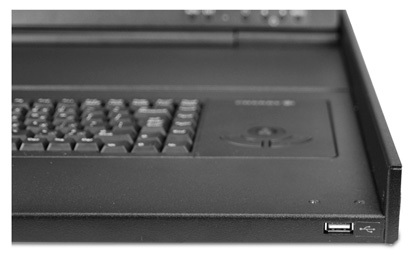 The Avocent ECS19PWRUSB is a 1U 19" LCD Tray that supports either a USB or PS/2 trackball and keyboard, and includes a mounting kit consisting of two outer rails with front and rear brackets attached, one railalignment spacer, one IEC connector power cable and related connector hardware. The Avocent 1U-high LCD Console Tray-only series provide convenient, direct at-the-rack access to KVM switches in enterprise data centers and SMB server rooms. Question: Have KVM switch with PS/2 ports for keyboard and mouse, do I need a USB to 2x PS/E converter to connect? Answer: Thank you for your inquiry. According to the tech spec information provided by Avocent for this unit, it should support PS/2 keyboard and mouse connections. Unfortunitly, we cannot find any images of the back of the unit to know whether an adapter is used to accomplish the connection. The quick instalation guide does not make any mention of an adapter, however, and only states to connect the video, keyboard and mouse connectors to either a server or switch in the rack cabinet. Question: I would like to connect a Longview 830 (PS/2 to the USB version of this product. Are there approved adapters for doing this? Answer: Thank you for your inquiry. Unfortunately, converting USB to PS/2 for the Longview 830 is not supported by Avocent and is explicitly stated as a potential problem in this Avocent support community thread: https://community.emerson.com/networkpower/support/avocent/desktop/longview/w/wiki/1414.i-have-no-keyboard-or-mouse-control-at-the-reciever-of-my-lv830-lv430.aspx. To accomplish this (if it is even possible), you would likely need some form of active converter to change the USB signal into something that the PS/2 port could understand. At any rate, we could not guarantee any type of conversion would work.